Most, if not all, people deal with the difficulty of loving someone when it seems like the most difficult thing to possibly do. Loving a suffering addict—whether they struggle with alcohol, drugs, lust, gambling, financial infidelity, eating, etc… is costly. It costs countless tears, sleepless nights, infinite prayer requests, and the sacrifice of setting aside one’s own desires for the good of the other. 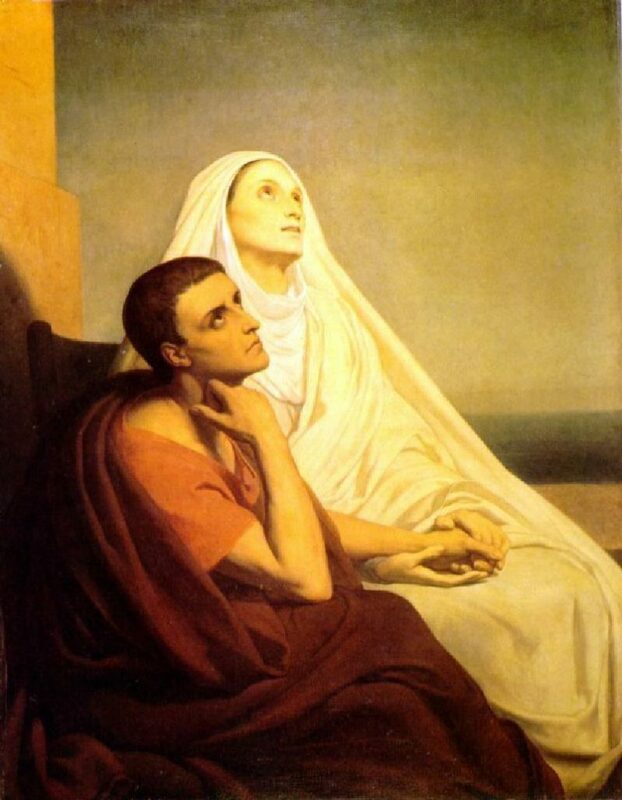 Saint Monica (AD 331-387) spent much of her life consumed with the afflictions and deviance of those closest to her. Her husband, Patricius, was well known for caving into temptations of the flesh. He was quite the Jekyll and Hyde: at moments he would show great deals of tenderness, affection, and devotion to his wife. At other moments he displayed fits of uncontrollable rage and anger, letting logic and reason escape him. He was a pagan man and, in addition to verbal and physical abuse, he was guilty of letting his sexual desires get the best of him, which resulted in marital infidelity. Before he was known as a great saint and Father/Doctor of the Church, Monica’s son, Augustine, was a wild child and young man who gave into passion, vice, and lust. His deviance and endless pursuit of pleasure was a great source of anxiety and endless tears for the faithful Monica, who made it her life mission to convert her husband and son to Christianity. She ultimately succeeded and saw both Patricius and Augustine baptized as Christians, while converting many others in the process (including her mother-in-law). However, as many of you can probably relate to, it did not come without a cost. It cost Monica years and years of perseverance, prayer, patience, self-sacrifice, and courage. There is much we can learn from the life of Saint Monica to better our own spiritual journeys and relationships with those we love the most. Here I have outlined five integral aspects of her life and devotion to our Lord that we can mirror to become better mothers, fathers, brothers, sisters, sons, daughters, friends, family members, and companions to those we care about. The hardships that come with seeing a loved one fall victim to addiction can’t be given justice by words. Tears seem to be the only way to truly acknowledge the heartache that is felt by so many. This hardship can make it feel like God is not answering our prayers or can even make some question His existence. Monica, with a faith that was formed at an early age, gave her trust to the Lord through intercessory prayer for both her husband and her son. In fact, it is said that Monica prayed regularly for the conversion of her husband for as long as 30 years and for the conversion of Augustine for 17 years. That is an incredibly long time and a display of endless devotion. Monica’s example of never-ending trust and love portrays the principle of following the “next indicated step” (in this case, praying unceasingly) and leaving the results up to God. She did this even through the great pain her son (and husband) caused her. As noted above, Monica’s husband was often overcome by rage and irrational thought/action. It is said that Monica held her tongue during these bouts—certainly not because Patricius was right or just to be acting that way, but because responding when he was illogical would be of no use. Her timing was exemplary, which certainly was not an easy way to handle these situations. Without any thought, it can be very easy to let the heat of a situation lead us to saying something or acting in a certain way that an have a negative effect. It must have taken a great deal of grace and interior discipline for Monica to show this much patience towards her husband in situations of such great injustice. Certainly this came as a result of her own devotion to God and trust in a power great than herself. When we seek to focus on the things we can control and surrender the things (or people) we can’t, we are more apt to pausing and waiting for the right time to act. At an early age, Monica was taught that making small sacrifices would ultimately help her achieve greater sacrifices. Thus, it was a regular practice of hers to fast from food and drink and offer up such hardships as a means of connecting herself to the cross of her Lord. Victories in small battles (I would argue that fasting is no small battle but a great one to establish virtue) help us conform our lives to tackle larger ones. This sacrificial love was not only offered to her immediate family but also to the servants of her home and other women in her community. It is understood that a few of the servants of her home spread rumors to her mother-in-law that Monica was speaking badly about her. This can naturally be the cause of seemingly justified resentment. However, Monica did not let that get to her nor did she take it personally. She used the opportunity to continually show by her actions that the rumors were not true while her love and kindness was useful in converting the souls of both her mother-in-law and many servants. The continuous prayers and persistence for the good of her husband and son drew itself from a level of faith that goes beyond hope. Monica displayed a certainty that the promise of God’s love would not disappoint, even though it took a very long time for the results to take place. While this likely did not make the suffering any easier, it must have given her the courage to continue her efforts and maintain her own spiritual well-being. Courage and fear are not necessarily mutually exclusive. In fact, courage—acting in faith while facing fear—was shown by Monica as her greatest anxiety in life came from the thought that she may never see her son, Augustine, baptized. Through his faults and vices, Augustine was also an incredibly talented scholar, speaker, and teacher. This led him away from Monica on multiple occasions to gain an education or follow a professional opportunity. Each time he left her, Monica must have had the gut-wrenching pain that away from her he could end up in even worse trouble. Confident that God would father him through his journeys, as wayward as they would get, Monica never gave up on her son. There was a time—as I’m sure many mothers, fathers, and loved ones of a deviant addict can relate to—when Monica had to make the difficult decision not to allow her son back into her home due to the tragedy of Augustine’s situation. How this must have torn at the heart of this loving mother! God’s faithfulness to Monica came in the way of a dream that confirmed to her that the two would one day stand together, united by the ties of Christianity. We can all look for moments of God’s faithfulness to us we deal with similar pains around making difficult decisions for our loved ones. Monica later met a man named (Saint) Ambrose, bishop of Milan. Ambrose had a way of preaching the Word of God that captivated Monica and later Augustine. He was impressed by the faithfulness of Monica as she devoted herself to his church. Upon her request, he came to offer a fatherly relationship to Augustine who would later mention how fond he was of the teaching and guidance of Ambrose. The effects that Ambrose and a few others in Milan had on Augustine ended up being the final push towards his conversion to Christ and willingness to profess his faith as a Christian. It takes a great deal of humility to seek the help of others and concede that we may not be able to influence our loved ones the way that another person can. Monica’s faith in the Lord, persistent prayer, and trust in the instruments of God’s love for her and her son provided the conversion of one of the greatest Catholic Christian thinkers in history—a man that history may have forgotten had it not been for the unending love of a saintly mother. [i] Confessions V, 8, 15. [ii] Falbo, Giovanni. St. Monica: The Power of a Mother’s Love. Translation: Matthew Sherry. 2003. I appreciate this post of St. Monica. Good Work! So good to know some of the details of the life of St. Monica and Augustine! Thank you! Thank you for these helpful ways!